Different human rights treaties provide for the right to marry. Kenya has ratified most the treaties that guarantee the right to marry under international law. This includes the International Covenant on Civil and Political Rights (ICCPR) (article 23), International Covenant on Economic Social and Cultural Rights (ICESCR) (article 10), Convention on Elimination of All Forms of Discrimination Against Women (articles 9, 16), Africa Charter on Human and Peoples Rights (ACHPR) (article 18) and more importantly article 23 of the Convention on the Rights of Persons with Disabilities (CRPD). Both the ICCPR and ICESCR guarantee equal application of the rights by prohibiting discrimination. Article 2(1) of ICCPR and article 2(2) ICESCR proscribes discrimination in the application of the rights under the convention. Even though there is no express mention of the term ‘disability’ it has been argued that the term ‘other status’ includes disability. Therefore these instruments impliedly protect discrimination based on disability. Article 23 of the CRPD clearly provides that state parties must ‘eliminate discrimination against persons with disabilities in all matters relating to marriage.’ The CRPD continues to state that all laws that deny this fundamental right should be repealed. Article 5 of the CRPD also guarantees people with disabilities to be treated like other citizens. Article 12 of the CRPD guarantees people with disabilities to equal recognition before the law. Hence, state parties like Kenya must not only repeal laws but also not pass laws that deny persons with disabilities equal recognition before the law. The Marriage Act is clearly in contravention of these obligations. The right to marry is not absolute and states have the discretion to limit the right. Before the adoption the CRPD in 2006, many countries including Kenya had laws that limited this right on ground of mental incapacity. However, since the adoption of the CRPD there has been a change at how countries limit rights based on disabilities. It is the contention of the author that limiting the right to marry simply because one is suspected of being mentally ill violates the basic principles of non-discrimination and equality as this is in fact unreasonable. Some have argued that the limitation is legal because marriage cannot be entered without proper consent. However, this is a misconception that society has about people with mental disabilities, as some of them are able to understand and know the obligations that they are entering into. The Constitution of Kenya 2010 clearly proscribes discrimination based on disability. Articles 27(4) ensure that people with disabilities are guaranteed equal protection as all other citizens. Furthermore, article 54 also proscribes demeaning treatment towards people with disabilities. The Marriage Act 2014 clearly violates the basic principles that the Constitution of Kenya seeks to guarantee for people with disabilities. The right t marry as has been held by the US Supreme Court in Loving v Virginia 388 US (1967) is a fundamental right, and laws that limit this right should be able to pass the constitutional muster of strict scrutiny. In conclusion Kenya is in violation of international obligations as provided by the treaties that guarantee the right to marriage. More importantly Kenya in 2008 ratified and signed the CRPD that expressly mandates states to ensure that rights of persons with disabilities are guaranteed and protected. The right to marry may not be absolute but limiting the right based on disability is clearly unreasonable. 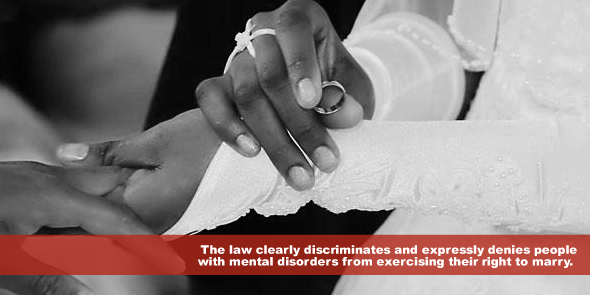 Therefore, people with mental and psychosocial disabilities also have a right to marry. William Aseka holds a Bachelor of Laws (LLB) from the Catholic University of Eastern Africa (Kenya) and a LLM at the Syracuse University College of Law, New York (United States). He is a Human Rights Fellow at Burton Blatt Institute, Syracuse University. His research interests are international human rights and comparative disability law..
There’s entirely no discrimination against people with disabilities,where it concerns right to marriage. What is paramount is clear-cut lucidity and sound mental health. Access to comprehensive healthcare is lacking in many African countries. This is why people with mental disabilities easily succumb to acts and attitudes inimical to their fellow humans. It’s eother they are nuisance or threats to both strangers,colleagues,loved ones,relatives and spouses. Our family orientation have roundly accommodated such people and provided care to them,especially to those amenable to care and love. They’re not abandoned to fate,especially when they’re in their most vulnerable state and not a danger to their care-givers and/or spouses.